We are told as Masons to avoid all sectarian religious discussion yet that is exactly what the Mainstream Grand Master of Florida Has done. In one written decision he has embroiled not only Florida Masonry, but Masons from all over the nation in a sectarian argument over religion, an argument that never should have come about. Here are Mackey’s 19th, 20th and 21st Landmarks. 19. A belief in the existence of God. 20. Subsidiary to this belief in God, is the belief in a resurrection to a future life. 21. A “Book of the Law” shall constitute an indispensable part of the furniture of every Lodge. And here is how this all came about resulting in the resignation of Brother Corey Bryson of Florida. I had considered for years becoming a Mason before ever taking the first step. I felt I was too busy, didn’t have the extra money, or otherwise just couldn’t commit wholeheartedly to the fraternity. I finally came to the decision in early 2012 that I wanted to pursue becoming a Mason. My life had finally leveled out and normalized. My kids were grown and had lives of their own. I also realized that I was losing my faith in humanity, and becoming jaded and cynical. I was hoping that Freemasonry would restore that faith and help me move along my path towards enlightenment. I contacted my local lodge, filled out my petition and waited for the news. Unbeknownst to me at the time, a fellow Mason and co-religionist had casually mentioned to the Jr. Steward at my lodge that I was a Pagan. I’ve come to learn that there were numerous discussions among the officers of the lodge prior to my initiation as to my suitability for Masonry. They finally agreed to proceed. A home investigation committee came and visited my wife and I at our house. I was asked if I believed in “a God.” I said that I did. I was asked if I believed in the immortality of the soul and the resurrection to a future life. I said that I did. The lodge voted and scheduled my Entered Apprentice degree for May 17, 2012. I was then passed to Fellowcraft on August 2, 2012 (my birthday) and raised to the sublime degree of Master Mason on September 6, 2012. During this time, another non-Christian was initiated into my lodge. He is an Odinist (and Tribalist) and has no hesitation mentioning his beliefs to anyone. At some point, his catechism instructor had a disagreement with him and allegedly criticized his religion. Tensions flared, the instructor was relieved of his EA class, but no further action was taken. The situation came to the attention of a DDGM, who proceeded to file charges against the instructor. After the lodge was called to refreshment, I approached the Grand Master and stated that I must respectfully disagree with his statement. I proceeded to tell him that nothing in my religious beliefs were in any way contrary to Masonic Law. He proceeded to ask me if I believed in a monotheistic God. I stated that I did. He then asked if I believed in the immortality of the soul with the resurrection to a future life. I concurred. He then proclaimed that I had no Volume of Sacred Law upon which to take my obligation. I stated that I recognized the “truth” in all VSL’s, and have no issue obligating myself on any. We parted, still not seeing eye to eye. A few weeks later, I received an email stating that I was to appear before the vigilance committee of my lodge by order of the Grand Master. I appeared before the committee with the assistance of a PM of my lodge who volunteered to assist me. I was asked again the questions relating to 32:16 of the Florida Masonic Digest, and again honestly answered the questions, in agreement with the Digest. I was asked if I was a Pagan, and explained that I used that term to describe my religious practices, but not my belief. Paganism is not Orthodox, and has no set doctrines. It is merely a blanket term for non-Abrahamic faiths. In definition of my beliefs, I stated that I was primarily a Deist. I was further asked if I could uphold Masonic Morality, as exemplified by the Golden Rule and the 10 commandments. I explained that the Golden Rule was a value to aspire to. Concerning the 10 Commandments, I had to educate the committee on the fact that the first 5 commandments were religious commandments that only really apply to Jews, but that the second 5 were values to aspire to as well. The Committee concluded that there was no reason for further action in my case. Apparently the Grand Master was not satisfied with this decision, and proceeded to issue his Ruling. After reading the ruling, I felt that I had no choice per my Master Mason Obligation other than to resign as a Mason. This morning, I went to my lodge and submitted my letter of resignation to the Secretary, along with my dues card. I cannot express how disillusioned I am with Masonry in Florida. I have had communication with Masons around the country who are just as shocked and appalled as I am. I spoke with the Sr. Warden of the Lodge after submitting my resignation, and he repeatedly said that he wanted me to understand that the officers of the lodge did what they thought was the correct thing in accepting me for initiation. He refused to make any definitive statement as to his own feelings. He said that he understood why I was upset, and asked me if I understood where they were coming from. All I could say was that I did. I understood that they were coming from a position of Self-preservation instead of their Masonic Obligations. The amazing part is this man, the Sr. Warden, was so impressed with me as a man and Mason that he was talking with me about serving in the line as recently as a month ago! Is this really what Masonry is about today? Have we slid so far from the ideals of our Masonic Ancestors that we now require petitioners to define their beliefs, making sure that they use the politically correct terminology? What happened to masonry helping to make good men better? My wife saw it in me in the past seven months. Unfortunately it seems that political infighting and wrestling for power supersedes the search for Further Light, at least in the Grand Lodge of Florida. Once again we see White Anglo Saxon Protestant only Freemasonry rear its ugly head, a story that The Beehive has been repeating over and over again to the disbelief of many. There is a certain segment of American Freemasonry that wants it to be White only and Christian only. In so doing they have let into their ranks those who practice Christianity in white robes holding burning crosses. The Mainstream Grand Lodges who look aghast at such practices refuse to do anything about it. They have allowed Freemasonry to be corrupted. They are responsible for the decline in Mainstream membership. All they need to do is declare such Grand Lodges as rogue Grand Lodges practicing bogus Freemasonry and pull recognition from them. The dirty laundry of these rogue Grand Lodges rubs off on the good ones and all of Freemasonry is poised to be flushed down the toilet. We prefer to lend a blind eye to the lessons of PGM Frank Haas, Derek Gordon, Mike McCabe, Gate City Lodge No 2 of Georgia and others. If we just ignore all this and pretend it doesn’t go on, that it is really none of our business, then we can delude ourselves that everything is right within the world of Freemasonry. But everything isn’t right and it won’t be until we are determined to make it so. Freemasonry is supposed to be universal. It crosses across all economic. political, cultural and RELIGIOUS lines. All that most Grand Lodges require is a belief in Deity or a Supreme Being. Brother Corey Bryson answered all the questions his Lodge had about his religion twice. He said that he believes in one Supreme Being, the immortality of the soul and that he had no issues with any Volume of the Sacred Law. That should have been enough. But not for this Grand Master. The Grand Master quoted only a small part of the ancient charge he refers to in his edict. Here is the complete text. No atheist can be a Mason. Masons do not care what your individual faith is — that is a question between you and your God — but we do require that a man believe in a Supreme Being. Masonry insists on toleration — on the right of each person to think for himself in religious, social and political matters. Paganism is not a formal religion but is a generalized term used to describe all non-Abrahamic beliefs. The Grand Master of Florida is saying that only Jews, Christians and Muslims can become Freemasons. That’s absurd and is a corruption of the traditions and long held beliefs of toleration and non conformity to any doctrine that Freemasons have held for Centuries. What about Deists who were Masons and who were instrumental in drafting the Constitution of this great nation? What about Buddhists and Hindus? If you go to India you will see five different Volumes of the Sacred Law on their altars. That is a testament to the universality of Freemasonry. This Grand Master is codifying his own personal religious beliefs into Freemasonry thereby making the practice of Freemasonry in Florida no longer Freemasonry at all. Soon we will celebrate Christmas, a holiday with Pagan roots, incorporating pre Christian festivals that were celebrated around the winter solstice, why don’t we all send Grand Master Jorge L. Aladro, a little mind and a happy Pagan day card? You can send him one, care of the Grand Lodge at 220 North Ocean Street, Jacksonville, FL 32202. I ran into a problem where I sought membership about a month ago , and the GM of the Canadian Lodge Said he had spoken to the Grand Lodge of Canada , And said that I could not be a free mason Because I could not swear on a Holy Book consisting of only one Volume . That answer makes no sense to me as A Druid We see all faiths as having Value and having truth , I made my case with ( I will call him DP ) D.P saying I could swear upon any religious book because of my open view , His Reply was that it dose not work that way , one can not Just pick a religious book and swear upon it , it has to be of my religion . D.P did not even give me a chance to represent my case to the Grand Lodge of Canada myself He claims that he spoke with them . D.P was also upset at the fact that I was given info from non Canadian Masons , His view is that only a Canadian Mason has say in such matters , there for opinions of others that are not Canadian Free masons are invalid . Is there is anyone who can help me Please let me know what I can do . If anyone is still reading this we have to remember that all of our brother were shackled by their space in time. Yet they are still our brothers. Just like the writers of the great books were also shackled by their space in time as well. Who’s to say the lessons that any of them teach do not hold teachings to assist us all in our own daily lives. Sometimes brothers agree and sometimes they do not. At the end of the day they are still brothers. I am a Mason like my father before me and his father before him. I am also a brother in Florida in the same manner. What we strive to hold onto are the ideals and principles of what Masonry is. And they will always be the search for knowledge and enlightenment. On the journey we assist each other and try to make each other, as well as the world, better! Plain and simple! If you want to be hung up on the views of one or a couple that is certainly your choice but I understand the bigger picture. I share the knowledge that those ignorant brothers are simply men that are shackled by their personal beliefs in their time. Yet they are still my brothers even though I may not have the same restraints on or even though I have a different perspective. Because to gain an enlightened view of things you need every color of the spectrum to come together. We do make good men better. The new guard with the understanding of the world we live in is here and the regime of old will eventually step aside with their narrow minded views. They will be revered for the contributions they have made whether the opinion is good or bad. All we do is contribute all of us. So the brothers that come after us can enjoy the knowledge from our successes and our faults as a whole complete spectrum and continue our “Faith”. Which is simple, a faith in humanity guided by filial love, morality, friendship and brotherly Love. If you want to meet the real south Florida brothers and find out how we really feel come commune with us and I am sure you will be happy with what you discover. Our contributions to what is good and right with freemasonry continue. 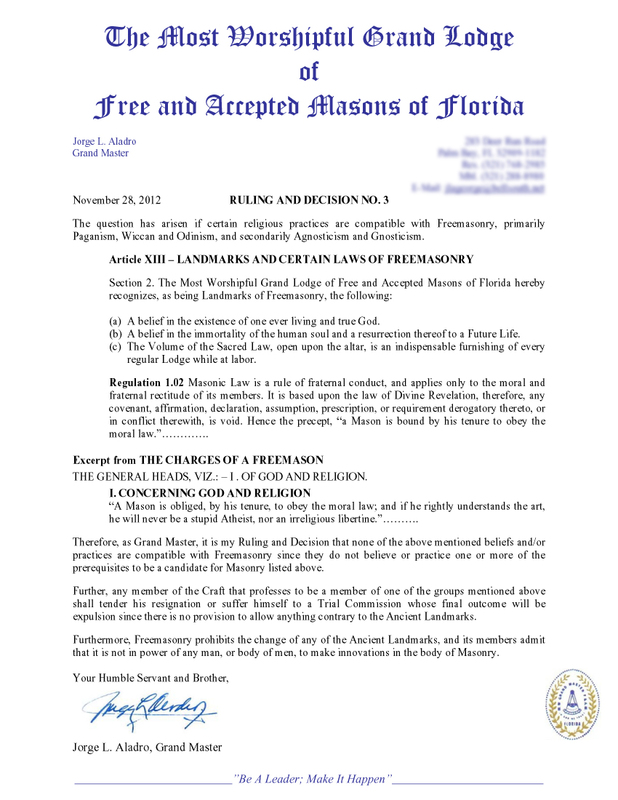 Unless and until the brethren of Florida rise up and exercise their masonic duty to expel the alleged “Grand Masters” who have acted so unmasonically, I consider the GL of Florida to be clandestine, and therefore, I cannot sit in Lodge with a FL brother.